To celebrate their 25 year anniversary, Pro-Ject Audio are combining traditional design with modern technology in a brand new turntable model. 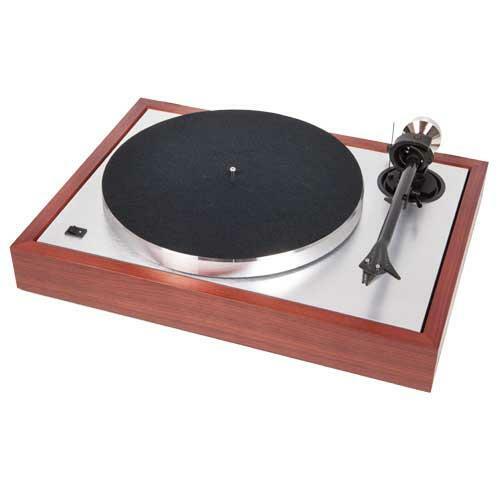 The aptly named 'Classic' is a sleek, compact and elegant turntable based around the "frame" design popularised by the likes of Thorens and Linn in the 1950's and 60's, but implemented with the innovative technologies Pro-Ject have become known for. The two-plinth design allows the motor to sit in a separate plinth to the bearing and tonearm, reducing the unwanted transference of electrical and mechanical noise. The two medium-density fibre plinth sections are isolated from each-other with the use of specially selected Thermo-Plastic Elastomers (TPE). The use of TPE, rather than the spring-loaded method of historical designs, makes The Classic effortlessly simple to set up while retaining anti-resonance properties. The idea of anti-resonant structures also carries through to The Classic's platter. The general layout was inspired by the iconic Debut platter assembly, but the main platter has been significantly upgraded to a special aluminium alloy version which is internally lined with TPE damping. The sub-platter and bearing are also similar to the Debut design, but the tolerances are far tighter for The Classic, resulting in a higher-quality performance. The Classic also boasts a radical new tonearm design, inspired by the production processes developed for the award-winning RPM 3 Carbon turntable. The tonearm tube is made from a sandwich composite of carbon and aluminium. The carbon fibre gives the arm rigidity, speed and reduced mass, while the aluminium delivers better overall damping. The tube is then supported by a new bearing assembly with ultra-low friction and wider movement for improved tracking. The nickel-plated counterweight not only looks fantastic, it's also TPE-damped to ensure the arm remains acoustically neutral. The Classic tonearm can also be VTA and azimuth adjusted to suit almost any modern pick-up cartridge. The Classic is supplied as standard with the Ortofon 2M Silver cartridge, which has been developed exclusively for Pro-Ject Audio. This popular moving-magnet design allows The Classic to perform to a high standard right out of the box, and also offers upgrade options as your musical journey continues. The Classic is also supplied with a fitted dust cover, a junction box for easy cable upgrades and the Connect-IT E RCA cables. The three finishes (eucalyptus (black), rosenut and walnut) also mean The Classic can fit into any decor.